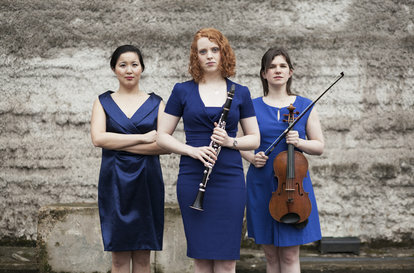 Featured in Classical Music Magazine as one of the 'front runners taking to the chamber music stage", the Jacquin Trio are rapidly establishing a reputation for their dynamic performances and spirited music making. Winners of the Royal Overseas League and the St Martin-in-the-Fields Chamber Music Competitions, the trio have performed extensively across the UK as Making Music artists and in some of the most prestigious venues in the country. They have been recognised with awards and prizes from the International Music Competition 'Salzburg' Grand Prize Virtuoso 2016, Park Lane Group, the Solti Foundation, the Fidelio Trust, the 19th International Chamber Music Competition in Thessaloniki, Greece, the RCM's Douglas Whittaker Prize, and the Tunnell Trust, the latter seeing them complete a critically acclaimed tour of Scotland in 2014. The Jacquin Trio will be performing in New Zealand as part of the Royal Over-Seas League, where they will be adjudicators.